In 1972, a crack commando unit was sent to prison by a miliatry court for a crime they didn't commit. These men promptly escaped from a maximum security stockade to the Los Angeles underground. Today, still wanted by the government, they survive as soldiers of fortune. If you have a problem, if no one else can help, and if you can find them, maybe you can hire... The A-Team. For those not aware of the pedigree, The A-Team was an TV action series that debuted in 1983. It revolved around a team of four special forces guys who each week would hire themselves out to some to some family trying to save their home or their farm or whatever from some corrupt guys trying to run them out. Generally each episode would end in a wild gunfight, where the team would overcome superior numbers by a "plan" that probably included a lot of explosions and noone ever got hurt. Part of the success of the eighties series was Mr. T, who rode a starring role in Rocky III into becoming a pop culture phenomenon, with his own cartoon and cereal. 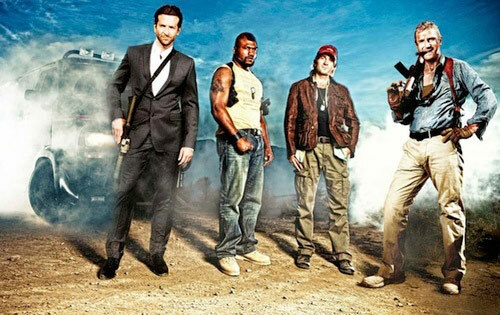 The A-Team, like Mr. T, is a novelty that wore thin after about three years.. a major overhaul to the show in the fifth season did not save it from being cancelled. When I talk to others from my generation about this show, we generally agree that the show is only watchable now if you've got nostalgia glasses on. And then I saw the trailer where the tank was falling through the air shooting at airplanes. The rest of the trailer didn't impress me, but that tank shot alone impressed me so much that I decided I had to give this a watch. Just took me awhile to finally get around to it. So this is the origin story. And I have to say, I'm tired of origin stories. The original A-team, like many stories of old, didn't need an origin story. They summed it up in the intro I quoted at the top, and didn't really explore their past until the fourth season. But this story actually worked pretty well. I'm surprised that they could actually bring these four characters together and have me buy into them bonding as quickly as they did... when in my head I know that flashing a special forces tattoo at the guy who just shot you shouldn't be an instant trust win. Going in, I really thought this would be a movie that at the end I would feel a little stupider for watching, but it always managed to stay just behind that line, the one where I feel ashamed of what I'm watching. I think it's because even though the film kept it's tongue planted firmly in its cheek, they made the threat of the bad guys feel real (the exact opposite of what Waterworld gave me), and the threat of going to prison for a crime they didn't commit, that never felt like a joke. 3.5/5 stars. Yeah I actually sorta liked the remake. Atleast much better than I thought I would. Seriously, I am surprised it was half-way decent, kinda like GI Joe Movie. Oh please god no. This can't ever be good!